Perhaps this is one of the most known 70s Greenlandic band outside of Greenland. However their first album still protects its mystery and in my opinion their first album is their best. Somewhere it says "Sume's LP was an overwhelming success. In a very short time it was sold nearly 10,000 times to Greenland's 50,000 inhabitants. However, while Sume was the face of the old Greenlandic Renaissance, the people's rediscovery of their own culture and the grafting of that culture on to the wild beast of Rock'n'Roll, Nuuk Posse represents the new Greenland. Modern (and hyper-modern) as Nuuk Posse sound, they carry the traditional Inuit culture to a new generation -- for example old Greenlandic drum dance recordings have been sampled on their latest CD. Along with Nuuk Posse, other artists like Ole Kristiansen, Iisaavaraq Petrussen and the rock band Inneeruulat are experimenting to combine tradition with modern music. But from limited knowledge, it would seem that Nuuk Posse is leading the pack at present. Artists such as Issarnerit and Sume sang about Inuit identity and made themselves present at many political gatherings. 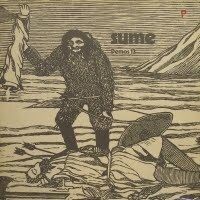 In 1973 Sume was actually the first Greenlandic band to release an album with Greenlandic songs in Greenland. The title of the album was ‘Sumut’ which translates to “where to” as a reference to what the future of Greenlandic people and language should be. According to an interview done by Karen Mohr Sokkelund with Karsten Sommer, the first person to produce and record Greenlandic music, “One of the goals of the project was to preserve the musical interest and musical life of a small country with a small number of people who speak their language. There seems to be something wrong with this file.It unstuffs fine and all of the mp3s show up in the folder, but when I try to put it in my iTunes, only 3 mp3s(the first 2 and another)load. I can't open the others from the folder, either. I downloaded it from 4 file sharing servers and the same thing happened each time.I'm really sad because it seems like an excellent album. Help! Try to reencoder the files, with no tags. Best if mp3 to wav to mp3 again. You can use DPPower to do it or any other software. Just rename the files to remove the special characters that are used for the language in question. I am sure that will solve your problem. Re: "but when I try to put it in my iTunes, only 3 mp3s(the first 2 and"
Could be a few things, but I guess a combination of nordic letters and also an "/" has sneaked its way into the tags. That said, could be your setup too. Anway, here is a retagged version with no nordic letters and "/"
And about iTunes <-- Foobar rocks. Thanks for all the help, folks. I tried renaming the files in the folder, but the same thing happened--and the ones that worked loaded into iTunes with their old names! Tried downloading the file that was supposedly retagged and didn't see any foreign characters in the tags, and the same thing happened. Tried to turn them into wavs in Easy Wav, but it wouldn't scan the file. So, I don't know. I will pass these files to my friend tomorrow who also uses I Tunes and see what happens to him. So it is likely to be the day after tomorrow (Friday) when I get further information. I played around with the files and was able to convert all of them using Sound Studio on my Mac. All I did was open each up in Sound Studio and then save them as mp3s replacing the existing files. I thought it'd be impossible to find this one! Is the Sound Studio software available for the PC? If so, is there a way to download it for free? Yeah, something is really wrong with these files. ID3 tag-it cannot solve it, and all available versions of this album on the net seem to be the same. Did anyone figure out a way to fix it without recoding (and thereby incurring significant loss)?